One Lucky Day: Oh Brother! On Sundays my kids all gather at our house for dinner and fun. Last week amid all the lovely chaos my two daughter-in-laws had a photo shoot with our newest grandson Derek. It was fun to watch them pose that sweet little boy for each shot. He is the most content and easy baby to work with! He would only occasionally open an eye while he was being molded and placed into position. 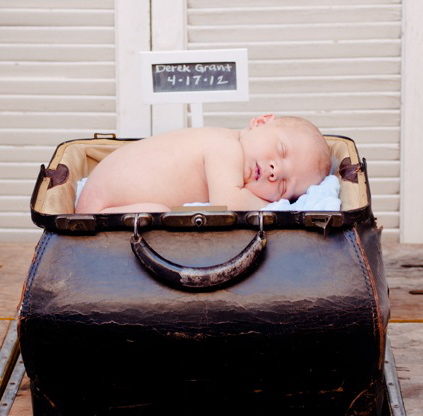 This one he was put in a vintage doctors bag.....It was lots of fun and being the proud grandma, I thought I would share! I have been wanting to do something with the darling photos of our newest grandson, Ezra, ever since the pictures were taken. And I finally figured it out! He needed a tray documenting his birth and how excited we all are to have him in our family. I “allowed” myself to use some old 7gypsies papers and ephemera that I have been saving (hoarding!) for just the right project. And this fit the bill! It was fun collecting the various items to include in his tray. First, I must give credit to Kathy Scoffield Photography for the delightful pictures. I was fortunate enough to be present during the photo shoot and she is amazing. I was intrigued with Kathy’s use of soft, cuddly blankets, hats, bottom covers and a hair dryer. It was fun to watch her work with Ezra to get him to pose just so and then be able to stay there for several photos. The total shoot took over two hours and he slept the entire time! By the way, the hair dryer was set on low and was aimed at Ezra to help him stay warm, since he had on so little clothing, and it kept him cozy so he would stay asleep! I love that trick! The first picture was cut in half to fit two slots in the tray. Cute, don’t you think? Ezra is the first brother in their little family, so the brother flashcard was appropriate. He is the 6th a welcome addition to their home. The domino in the bottom left corner represents the children in my daughter, Erin’s family. She has five sweet little girls, and finally got their boy in December! Needless to say, we were all elated at that prospect. I like the little yo-yo at the bottom. I tried to find one that would fit, but of course, that didn’t happen. So I improvised. 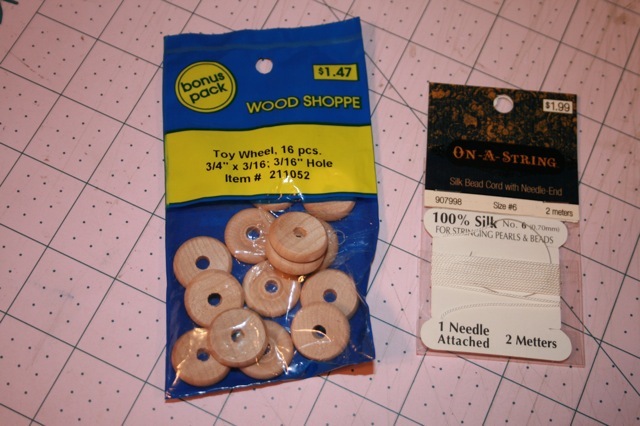 I used two wooden toy wheels (shown below) turned toward the inside and connected them with a small piece of a dowel. I then wrapped the center peg with string to make a yo-yo. Pretty easy, but it did take a bit of sanding of the dowel. I then used Vintage Photo Distress Ink with a blending tool to age it just a bit. I used some old Scrabble letters to spell out his name in one of the wider slots. The glass dome has a little tag that says “Boy”. The small fork and spoon are there because we all know how much little boys like to eat....and so far in this little boy"s life it has been all about getting him to eat and fill in those long skinny legs. In the bottom right portion of the tray, I included the statistics of Ezra’s birth. He weighed 7 lbs. 11 oz. I used a game piece for the number 7 and a Bingo calling game piece for the 11. I also used a Bingo game piece for the 21 to signify that he was 21 inches long when he was born. And luckily enough, I found an old clock charm that showed the time of day of his birth. Talk about a lucky day! And the small tag on the right shows the date of Ezra’s birth, December 14, 2011. The only things that weren’t in my personal stash of supplies were the two sports charms (which I found at Hobby Lobby) and the yo-yo, which I made. I guess it pays to have a stash of goods so you can make a special project whenever you’d like! Deb, love the tray! The stats and how you created the yo-yo are the best! Not to mention the adorable photos of your grandson. Your family time on Sunday's sound precious. Thanks for sharing. Gorgeous!! Mind you with an adorable subject like that....I'm sure a burlap sack would look good as a back drop...Still I love the project also...CONGRATS! The tray is absolutely adorable. Do you mind if I use the idea for a baby gift for a friend? I think making a tray for your friend is a great idea, hope Ann's inspiration helps. Love the picture of Derek in the antique doctor's case and the tray is amazing! So creative and something you will cherish forever. Too cute! Love this idea. What a cool tray! So many personal touches. Isn't he adorable - congratulations! And who knew Ann Mabee was your sister. I've been admiring her projects for quite some time now. I've seen a few on the 7Gypsies website. Must be in the genes! Thanks for sharing that incredible tray. I love it! Love the pictures and tray. Very creative on the little yo-yo. Thanks for sharing. How adorable. Love the picture tray.